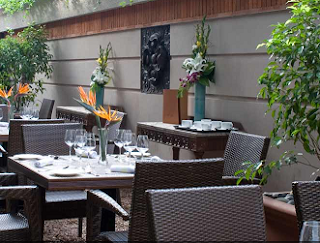 For a classy stay and restaurant experience in suburban Mumbai you cannot get a better option than The Juhu Residency Boutique Hotel, a hotel with a two decade old history. Located on the shores of the popular Mumbai landmark Juhu, the Juhu Residency, caters to both the leisure traveler and the business traveler. With its natural old world surroundings and modern amenities, and its proximity to the domestic and international airports, the boutique hotel is home to several elite business and glamour personalities. Juhu Residency offers 12 well appointed premium rooms for the leisure traveler and 6 executive rooms for the business traveler. Its famous restaurants are popular eating places among the well-heeled Mumbaiites - ‘The Melting Pot’, a multi cuisine restaurant with a delicious melting pot of cuisines with the choicest of sea food and desserts, and ’49 Grills’, a rooftop lounge, that specializes in grill and barbecue. Be it for leisure or business stay, or just to indulge yourself on a gastronomical luxury, The Juhu residency is the perfect place.